Russian cosmogony, a remarkable movement in the world's philosophical thought, emerged in Russia in the early 20th cen tury, in the Silvery Age of Russian culture. Among its major representatives were outstanding scientists, philosophers, prominent cultural figures, and Symbolist artists such as Vladimir Vernadsky, Konstantin Tsiolkovsky, Alexander Chizhevsky, Vladimir Solovyov, Nikolay Berdyayev, Sergey Bulgakov, Nikolay Lossky, Pavel Florensky, and Alexander Scriabin. A very important place in this movement belonged to Nicholas Roerich (9 October 1874–13 December 1947), who was a man of great erudition, a painter, a writer, a scientist, an explorer, a thinker, and a public figure. Being closely interrelated, all fields of his activity supplemented and extended one another, which allowed him to make a tremendous contribution to world culture, the true value of which has not been entirely understood yet. His ideas about people's spiritual unity are winning people's hearts more and more now, owing to the panhuman categories that underlie western and eastern cultures (beauty, knowledge and ethics). Nicholas Roerich's ethical and philosophical ideas were externalised in his art, to which the present publication is dedicated. Nicholas Roerich was born in St. Petersburg , into the family of a lawyer. His father expected that his son would attend the law faculty, but the young man was attracted by art. His family then decided that he would attend both the University and the Academy of Fine Arts . His teacher of painting was Arkhip Kuinji, a wonderful man and an original artist, whose phosphorescent canvasses captivated their contemporary observers. The young painter's graduation work Messenger: Tribe Has Risen Against Tribe (1897) was appreciated by Leo Tolstoy, and it was also purchased by Pavel Tretyakov for his gallery in Moscow . In addition, Nicholas Roerich studied the art of drawing in Paris , in the studio of Fernand Cormon. The French painter encouraged him to execute works on historical subjects. On returning from Paris , Nicholas Roerich married Helena Shaposhnikova, who was a niece of Modest Mussorgsky, and a great-great-granddaughter of Mikhail Kutuzov. She was her husband's constant companion in all his activities. As his muse, she became the principal source of his inspiration. They thought over the conception of his future paintings together, and they both worked hard to advance the ideas of Living Ethics — the teaching of life. Roerich's art was wellknown in prerevolutionary Russia . He was a unique historical painter who used his knowledge of archaeology in his work, a true symbolist and seer, a monumental artist and decorator of Orthodox churches, and a scenic designer for various theatrical productions, including Diaghilev's Ballets Russes. Nicholas Roerich was known as a publicist who made a significant contribution to the preservation of the world's cultural heritage; he was also appointed director of the Art School of the Imperial Society for the Encouragement of the Arts, and later, in the USA , he founded and ran the Master Institute of United Arts. His exhibitions, held in the late 1910s and early 1920s in Scandinavia, London and the USA , caused a sensation. The artist's canvasses impressed observers by their peculiarly Russian flavour; they were executed under the influence of ancient Russian icon painting, and Nicholas Roerich was among the first artists to study it and to use its elements in his work. The Roerichs always dreamt of travelling to the East. The dream came true in the form of a journey to India and an unexampled expedition to Central Asia: from the Himalayas to the Altai and back. This was not only an artistic exploration of the remotest places of Asia , but also a profound investigation of its spiritual heritage. All this contributed to the formation of his planetary, indeed cosmic, worldview. The findings of Nicholas Roerich's Central Asian expedition allowed him to establish a Himalayan research institute, Urusvati, which co-operated with the leading scientists of Europe and America . The idea of a Pact for the protection of cultural monuments in times of war, a Red Cross of Culture was how the author called it, made Nicholas Roerich one of the world's foremost public figures. The artist's friendship with the Indian leaders Jawaharlal Nehru and Indira Gandhi, and the correspondence of his wife, Helena, with Franklin D. Roosevelt, turned the Roerichs into ambassadors of western and eastern cultures. In many countries there appeared societies supporting the ideas of the Pact, and museums of Nicholas Roerich were founded in New York , Paris , Riga , and Prague . Being interested in spiritual matters from their early years, Nicholas and Helena Roerich gained a great Teacher, and under His direction they wrote a series of books on Living Ethics — a synthesis of both eastern and western wisdom. Having spent his last years in a mountainous area of India , the painter developed a true passion for mountains, and executed numerous Himalayan landscapes. Perhaps, no one could ever reproduce their unearthly grandeur so profoundly as was done by Nicholas Roerich. 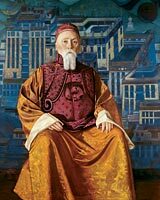 Jawaharlal Nehru said: “When I think of Nicholas Roerich, I am astonished at the scope and abundance of his activities and creative genius. A great artist, a great scholar and writer, archaeologist and explorer, he touched and lighted up so many aspects of human endeavour. The very quantity is stupendous — thousands of paintings and each one of them a great work of art. When you look at these paintings, so many of them of the Himalayas , you seem to catch the spirit of these great mountains which have towered over the Indian plain and have been our sentinels for ages past. They remind us of so much in our history, in our thought, our cultural and spiritual heritage, [not merely so much of the] India of the past, but of something that is permanent and eternal about India . That we cannot help feeling a great sense of indebtedness to Nicholas Roerich, who has enshrined that spirit in these magnificent canvasses” [Quot. from: Dilaram Shabab. Kullu: Himalayan Abode of the Divine. New Delhi : Indus Publishing, 1996. P. 96]. The painter always dreamt of returning to his Motherland, but permission was never given. He left this life in 1947 in Naggar, Punjab , India . His two sons followed the course of common family interests. The eldest son Yuri (George) Roerich (1902–1960) was an outstanding orientalist and polyglot, who contributed significantly to the successful results of the Central Asian expedition, due to his knowledge of oriental languages. The younger son, Svetoslav Roerich (1904–1993), followed in his father's footsteps and gained prominence as a renowned painter in India . His exhibitions were a success both in Russia and Europe . The Roerichs, who made an outstanding contribution to science, art, and the culture of the 20th century in general, are the brightest cultural phenomena, ones whose significance has not been entirely appreciated yet. During the years of the ideological dictate in the Soviet Union , the publication of the ideas of Russian cosmogony was not possible; these ideas have started entering our life only during the recent decade. Public interest in Nicholas Roerich's art is increasing apace. Exhibitions of his work in existing and newly opened museums, publications on his art and ideas, and worldwide scientific conferences on his achievements, are evidence of this. Roerich societies, founded and working in many countries, are making it their aim to study and popularise the heritage of the Roerichs, as well as the observance of the precepts of Living Ethics. In recent years, Nicholas Roerich's paintings have increased in price at established world auctions, whilst many collectors from Russia and other countries have strived to purchase his canvasses. 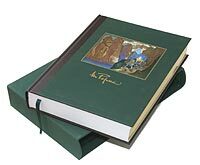 The present album is the first publication that presents Nicholas Roerich's art in an exhaustive way. Many canvasses from museums and private collections are reproduced here for the first time. It is rather difficult to show the master's many-sided art in full. He executed easel canvasses, scenery sketches, architectural studies, and works for the Russian Orthodox church, as well as producing sketches during expeditions. In addition to this, he liked to produce complete series of paintings; moreover, there were subjects which interested him all his life. That is why we present for your attention an album with sub-divisions according to subject areas, which cover, where possible, all aspects of Nicholas Roerich's heritage. With the exception of the artist's own series, such sub-divisions are undoubtedly rather relative. However, the accentuation of particular sides of the great master's art allows us to show his work in detail, and to illustrate its breadth and significance. The works of Nicholas Roerich are described in accordance with artist's lists, museum documents, and the data received from private collectors. The album was published by the International Centre of Spiritual Culture in Samara (Director — Yuri Rodichev; Director General of the publishing house — Helena Nikitina). Without doubt, the realisation of this grandiose project was possible due to the active co-operation of the Nicholas Roerich Museum in New York (Director — Daniel Entin), and the Moscow gallery Fine Arts Academy (Director — Andrian Melnikov). The publication was also prepared with the assistance of the International Roerich Centre, the State Museum of Oriental Art, the State Tretyakov Gallery, the State Russian Museum , and other museums in Russia . The author of the album's conception is Yevgeny Matochkin. The album was printed and bound by the Italian firm L.E.G.O. S.p.A.
Volume 1: Album, 672 pages. The album-catalogue in two volumes includes more than 700 works of the artist. Volume first will be sold in the present box.